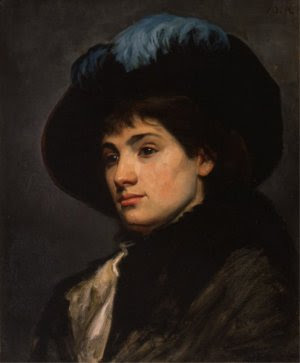 Marie Bashkirtseff was born on 24 November 1858 in Gavrontsi, Ukraina (then Russia) into a noble and wealthy family. When she was little, her mother left her husband and went to live with her parents near Cherniakhivka with her two children. Later, she decided to travel across Europe and brought her daughter with her. They lived in Germany, Italy and France. 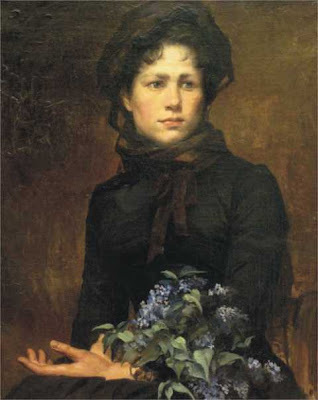 Marie was educated privately. 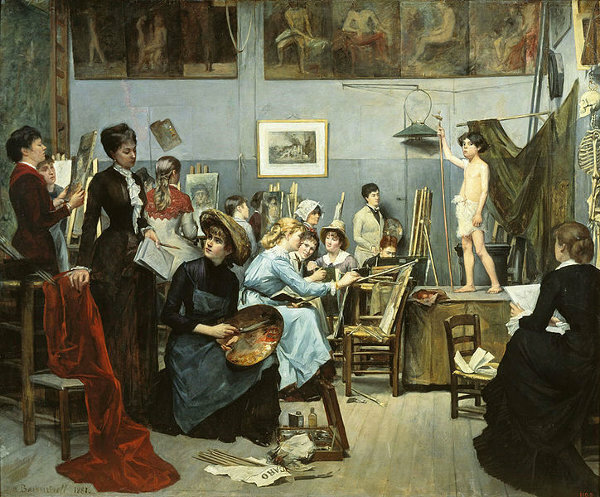 Like many other girls of her social class, she was taught drawing at a young age, but didn't really show a big passion for it. That all changed when, at 14, she visited Florence. The Italian capital of art, with its beautiful statues, monuments, palaces and paintings fascinated Marie, and soon she started spending hours in the gallery, roaming from room to room looking at all the different works of art, without ever sitting down or taking a break. "So long as there are pictures and, better still, statues to be seen, I am made of iron," she said. Marie loved those works of art which resembled nature and, instead, didn't appreciate Raphael much. In her journal, which she started keeping at 13, she wrote: "I don't like the Madonna della Sedia of Raphael. The countenance of the Virgin is pale, the color is not natural, the expression is that of a waiting-maid rather than of a Madonna. Ah, but there is a Magdalen of Titian that enchanted me. Only—there must always be an only—her wrists are too thick and her hands are too plump—beautiful hands they would be on a woman of fifty. There are things of Rubens and Vandyck that are ravishing. The 'Mensonge' of Salvator Rosa is very natural. I do not speak as a connoisseur; what most resembles nature pleases me most. Is it not the aim of painting to copy nature? I like very much the full, fresh countenance of the wife of Paul Veronese, painted by him. I like the style of his faces. I adore Titian and Vandyck; but that poor Raphael! Provided only no one knows what I write; people would take me for a fool; I do not criticise Raphael; I do not understand him; in time I shall no doubt learn to appreciate his beauties. The portrait of Pope Leo X.—I think it is—is admirable, however." That summer, she first had some problems with her eyes and then an attack of deafness. She was advised to go to Mont-Dore for treatment. Her hearing got better, although she didn't heal completely. Here, she was also diagnosed with tuberculosis. She started to avoid people as she couldn't hear them well, she didn't read much because her eyes were not strong enough to both read and paint, had problems breathing and coughed a lot. 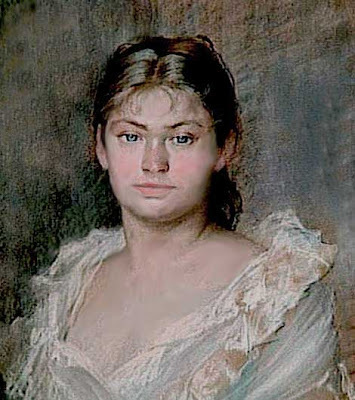 She was very ill the following year, but in 1882, once recovered, went to Spain, where one of her works, a copy of "Vulcan" by Velasquez, was greatly admired. The trip also benefited her inspiration. She wrote down in her journal: "I am wrapped up in my art. I think I caught the sacred fire in Spain at the same time that I caught the pleurisy. From being a student I now begin to be an artist. This sudden influx of power puts me beside myself with joy. I sketch future pictures; I dream of painting an Ophelia. Potain has promised to take me to Saint-Anne to study faces of the mad women there, and then I am full of the idea of painting an old man, an Arab, sitting down singing to the accompaniment of a kind of guitar; and I am thinking also of a large affair for the coming Salon—a view of the Carnival; but for this it would be necessary that I should go to Nice—to Naples first for the Carnival, and then to Nice, where I have my villa, to paint it in open air." Although her illness was progressing, Marie kept working, prodded on by her desire to do something worthwhile and special in art that would live after her. Around this time, she also tried sculpture, but did only very little in this art. 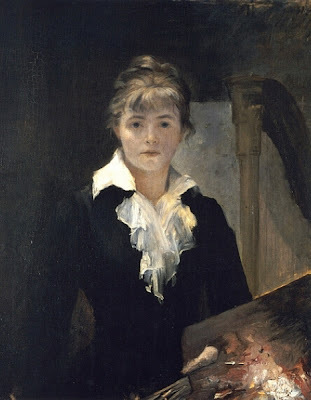 In 1884, she exhibited what became her most famous painting at the Salon. 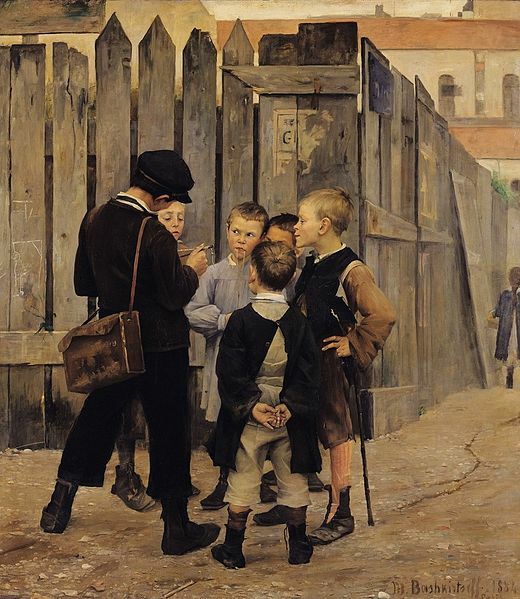 It was called "The Meeting" and shows seven gamins talking together before a wooden fence at the corner of a street. The picture was received with praise by the critics and brought her to the attention of the public, who greatly admired it too. Was Marie happy of her success? She wrote: "Am I satisfied? It is easy to answer that question; I am neither satisfied nor dissatisfied. My success is just enough to keep me from being unhappy. That is all." And continued: "I have just returned from the Salon. We remained a long time seated on a bench before the picture. 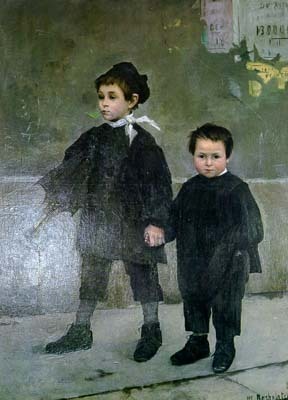 It attracted a good deal of attention, and I smiled to myself at the thought that no one would ever imagine the elegantly dressed young girl seated before it, showing the tips of her little boots, to be the artist. Ah, all this is a great deal better than last year! Have I achieved a success, in the true, serious meaning of the word? I almost think so." Marie now received many requests from people who wanted to reproduce and photograph "The Meeting" and from connoisseurs wishing to visit her study. The following year she wasn't so lucky. 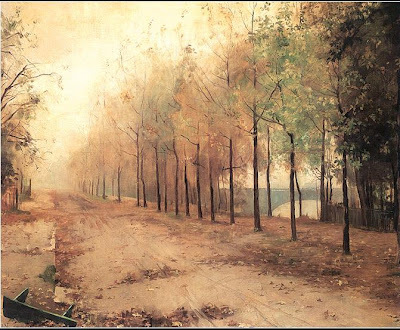 She didn't receive any medals for her work "Spring", which she had gone to Sevres to paint. 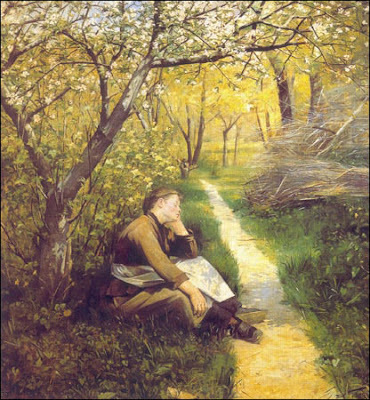 Many people thought this was due, rather than to the quality of the picture, to a comment Marie had made publicly the year before: she had called the committee "idiots". Yet, her success didn't wane. People still kept buying her works. However, the artist didn't seem to believe she had achieved much. She wrote: "I have spent six years, working ten hours a day, to gain what? The knowledge of all I have yet to learn in my art, and a fatal disease!"